On Wednesday 7 September 1642 the English Civil War came to Yeovil when Babylon Hill, just to the east of Yeovil, was the site of a somewhat minor skirmish known as the Battle of Babylon Hill, in which a force of Parliamentarian Roundheads under the control of the Earl of Bedford defeated the Royalist Cavaliers under Sir Ralph Hopton. On 5 August 1642, Colonel Strode, Sir Alexander Popham, Sir John Horner and other gentry of Somerset gathered their Parliamentarian forces and occupied a commanding position in the Mendip Hills above Wells and the headquarters of the Marquis of Hertford. While the Parliamentarians were poorly-armed, their numbers were huge and after a stand-off, Hertford ordered a withdrawal from Wells in order to concentrate the Royalist forces at Sherborne, Dorset. As Hertford repaired the defences of Sherborne castle, Parliament sent the Earl of Bedford to take command of its Somerset forces. By the end of August 1642, Bedford had mustered a force of 7,000 foot, eight troops of horse and four artillery pieces at Wells in preparation for a march on Sherborne. When the Parliamentarian army reached Sherborne on 2 September, the Royalists withdrew to the castle but were surprised when the Parliamentarians did not take possession of Sherborne but instead set up their camp a mile to the north. While Sir Ralph Hopton with some three hundred musketeers occupied Sherborne, Sir Thomas Lunsford commanded the garrison in the castle. On 4 September, the Parliamentarians began to move their artillery closer to Sherborne, but Lunsford set up a battery of small field pieces in the castle. 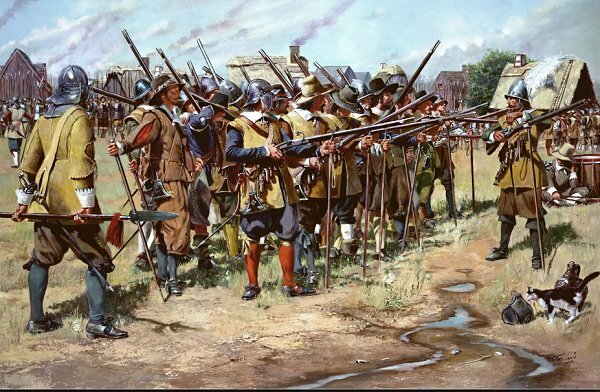 When he opened fire on the new Parliamentarian position, 800 of Bedford's troops are said to have fled in panic. Bedford abandoned the siege of Sherborne on 6 September and marched his troops towards Yeovil while complaining vociferously of desertion and cowardice among his men. On 5 September the Marquis of Hertford sent Sir Ralph Hopton with a hundred horse, sixty dragoons and two hundred musketeers to reconnoitre the surrounding region. Hopton positioned his troops on Babylon Hill in order to observe the Parliamentarians guarding the bridge over the River Yeo at Yeovil. There was some minor skirmishing during the day although there appeared to be some reluctance on the part of the Parliamentarians to approach the Royalist positions and, as evening fell, Hopton prepared to return to Sherborne. 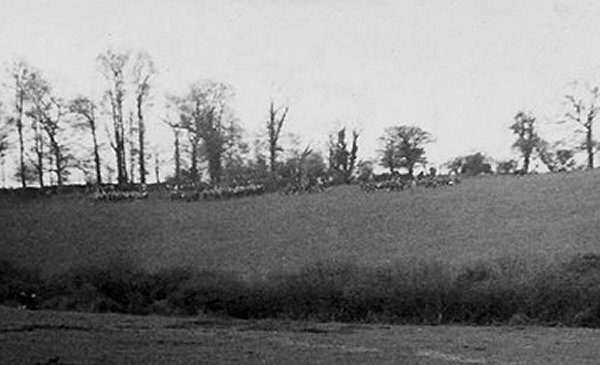 As the foot were marching away, with the dragoons and horse covering their rear, the Royalists suddenly realised that two troops of Parliamentarian horse had advanced unobserved along the deep-sunk hollow lane, known as Bradford Hollow, to launch a surprise attack from different directions. Hopton and his officers struggled to reform the cavalry to fend off the attack and were almost routed. However, the Royalists managed to retain cohesion and retreated in good order to Sherborne, for the loss of about twenty men. Faced with a generally hostile Somerset population and discouraged by news of the surrender of the Royalist garrison at Portsmouth, the Marquis of Hertford regarded his position in the West as untenable and consequently abandoned Sherborne Castle on 20 September 1642. He then marched through Somerset to Minehead, with the intention of crossing the Bristol Channel to raise support for the King in south Wales. The following eye-witness account was extracted from a letter sent to Parliament from Dorchester three days later, signed by the Earl of Bedford and others. It was produced as a pamphlet entitled "A Relation of the Actions of the Parliaments Forces, under the Command of the Earle of Bedford, Generall of the Horse, against those which came from Sherbourn unto Babel-hill néer unto Yevvell, upon Wednesday the seventh of this instant Sept. 1642". "Upon Tuesday the sixt of September, the Parliaments Forces did rise from before Sherbourn, and went that night unto Yevvell, a towne being four miles distant from Sherbourn; where we lay on Wednesday to refresh ourselves, upon which day it pleased God to give us a great taste of his goodness, to the great shame and losse of the enemie: About two of the clock in the afternoone there appeared a great body of their horse and foot upon a great hill within a little mile of the Towne called Babel-hill, and so was it truly to them a Babel of Confusion. Upon which we presently put our selves in Array as well as we could, to make good all the out-ways, and guard the Magazine, which to doe we found but very few men, and more Pikemen than Musquetiers, for the Musquetiers found themselves to be most employed upon all occasions, and therefore they principally shifted away, and we sent out to that side where the enemie appeared, three Troops of horse, and some Musquettiers, they standing still at the top of the hill, braving of us, and calling us Rogues and Round-heads, our men went up the hill to charge them, Captaine Aiscogh one way, Captaine Tomson another way a little after him, and Captain Balfour a third, and our Musquetiers after as fast as we could; Aiscogh came up to them first, and charged one of the Troops through and through, and charged the second, but then was glad to wheel about; by that time Tomson came in to him, and upon the sight of him all the enemies horse began to shog a little and our two Troops coming to charge, they turned and ran away, disbanded and routed, and ours followed upon the execution, and killed many of them, they think about eighteen or twenty, some very well habited, who seemed to be persons of qualitie, and their foot who had played upon our horse and foot coming up the hill, were left to our mercy, our foot and horse killing them, and they running away like dogs: He that commanded them was one Bamfield a Serjeant Major, who is taken prisoner, and with him about a score of his common Souldiers, the rest that commanded the foot are beleeved to be slain; amongst them one Hussey a Captain, for his Commission was found in his Pocket, himself clad in plush, Balfours troop was forced to fetch a great compasse, for it is a very high hill, and ill way who could not come in soon enough; if the night had not come on and a very darke one, we had made a great execution amongst them, for their whole strength of horse was there, five of six Troops and most of their foot, Sir Ralph Hopton was there with his Troop, Captain Digby, and Sir Francis Hawley with theirs, and the Lord Paulet, Sir John Paulet, Sir John Stowell, Sir Thomas Lunsford, Colonel Asburneham, Sir John Barteley, Colonell Lawdy, and Lieutenant Colonel Lunsford were there: we do verily beleeve that some of them are come short of home, for they came in the night before the Moone rose with lanthorns and candles, and fetcht away the bodies od them of qualitie, we only found the next morning twenty or thirty of our men; there were but five lost in all, and a very few, not above three hurt, all (but one) of the slain, are of Captain Aiscoghs Troop, who hath shewed himself a very valiant yong man; We desire to know what must be done with the prisoners, whom, till we receive order, we will take care shall be safely kept: Thus it hath pleased the good God of Heaven, who is the great God of Battailes to blesse us, whose name we cannot sufficiently magnifie for his goodnesse to us, bringing on the Enemie in thier great jollity and strength to be so shamefully defeated by an handfull of us, and those who were tired out with extraordinary sufferance of watching and cold; Blessed be his Name for it." 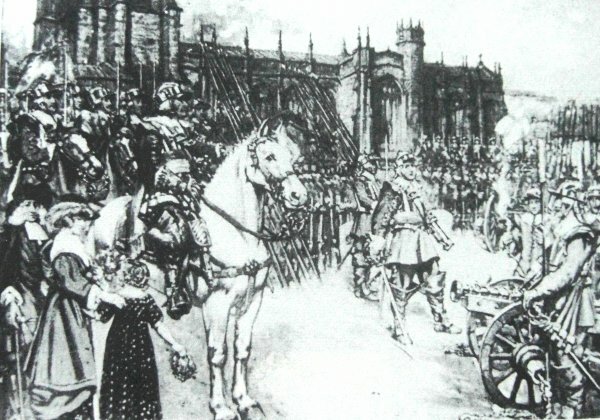 One of the paintings lost in Yeovil's Town Hall fire of 1935, "The muster of the Earl of Bedford's forces in the parish churchyard" by Dorset artist Francis Newberry. A re-enactment of the Battle of Babylon Hill, circa 1977. 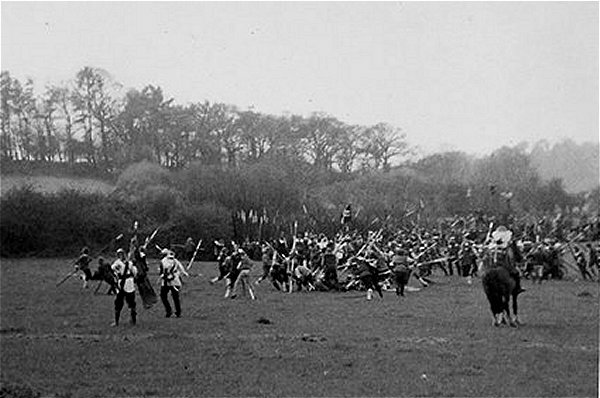 The re-enactment of the Battle of Babylon Hill, circa 1977.